After a dry February followed a wet December and January, much needed El Nino storms returned during early March. However that also made unworkable day trips to some of my favored SF Bay Area region parks with wildflowers as storms occurred on weekends for this m-f 8-5 working person. On Saturday March 12 as a storm sat over northern sections of our region, areas to the south remained on margins of the storm with winds difficult but not impossible for photography. 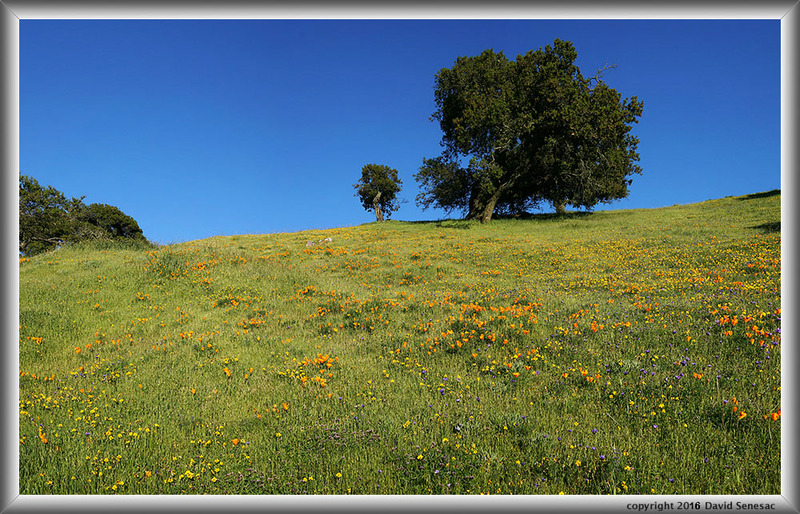 Thus drove to the Pacheco Pass region visiting the San Luis Reservoir Wildflower Area, SLRWA. 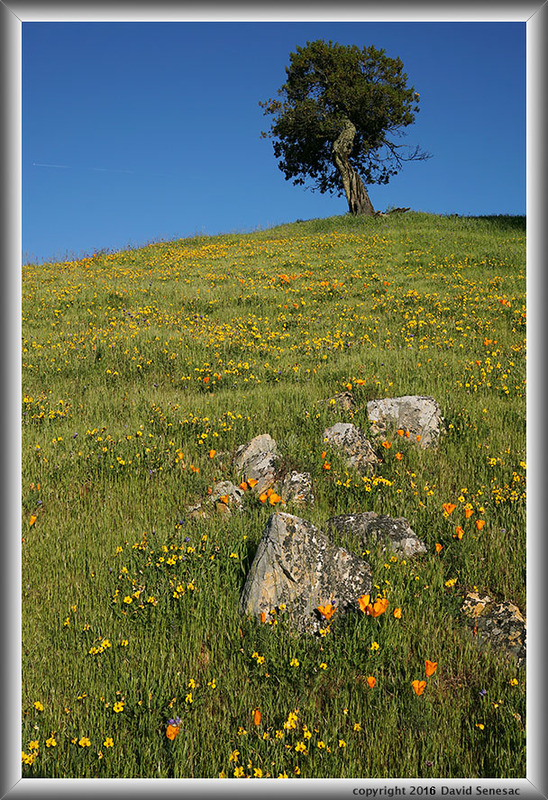 The area is adjacant to Pacheco Pass State Park somewhat protected from storm winds on the lee side of the pass. 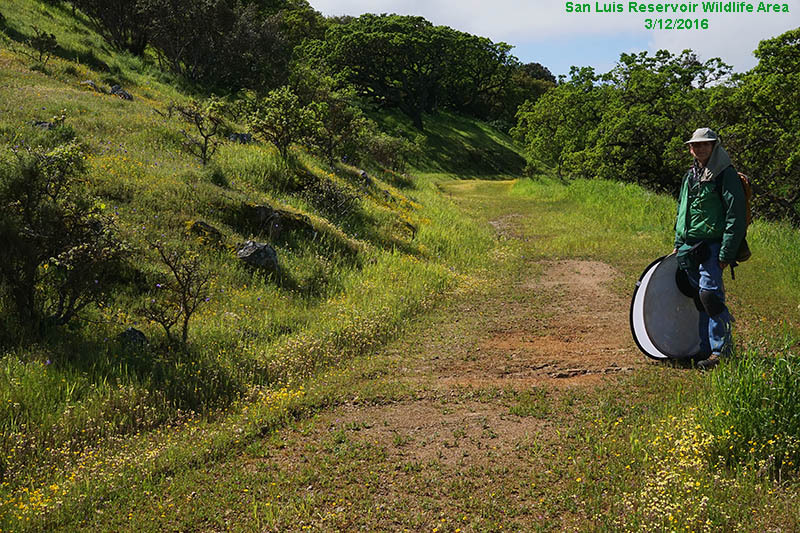 The east boundary of the park is the San Luis Reservoir State Recreation Area and the north boundary, highway SR152. Several dirt pullouts along Dinosaur Point Road provide access through gates on barbed wire fences and unlike the state park, access is free. There are no hiking trails in the WA but rather old bulldozed ranch roads. If lucky one may see black-tailed deer, coyote, gray fox, wild pigs, and tule elk. Walking cross country off the ranch roads is straightforward much like at the nearby state park. Some areas have poison oak but it is easily avoided. Following is a link to an online topographic map of SLRWA with the map center crosshairs where I would recommend parking: link. As I arrived at 9:30am skies were variable mostly cloudy and it did not rain during my visit. From the dirt parking area at the 1000 foot elevation, I dropped east down 100 feet through trail-less oak grasslands to the ranch road and then followed that left, west. That is the dotted line on the map. For these images I used my Sony 24mp A6000 with Sigma 60mm F2.8 DN or 30mm F2.8 DN lenses atop my Benbo Trekker tripod. The wind considerably limited my work and some sets of images as expected were impossible to recover. A limitation with blending image techniques is a necessity of perfect registration of elements between frames so if a breeze moves plant flowers, leaves, or stems even slightly, the resulting fine detail overlap quickly becomes hopeless. I used my two collapsible circular disks, a diffuser and a reflector to block the wind. 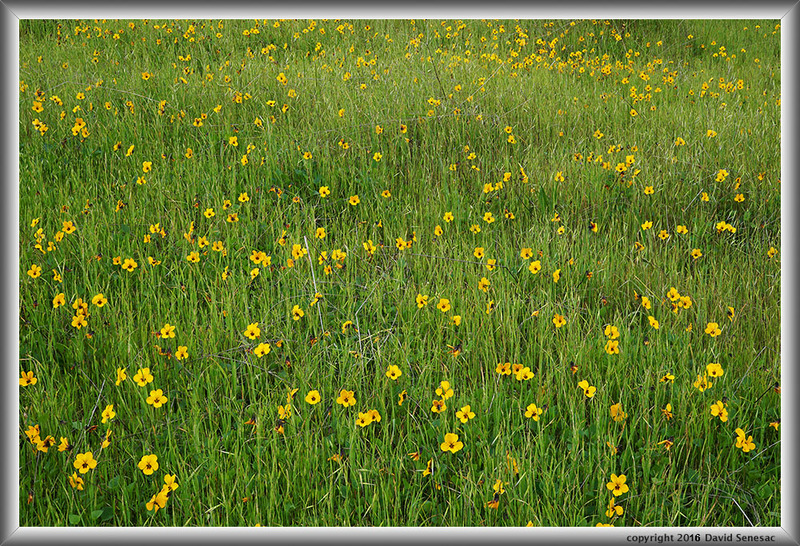 The blue oak savana grassland slopes had abundant wildflowers that indicated rains have been good this winter. And soils were rather soft from the recent series of storms that also left puddles on the ranch roads. Atop the ranch road were patches of dense butter&eggs and goldfields. Although these photos show dense areas of wildflowers, there are significant areas where knee high grasses were dense without any wildflowers. 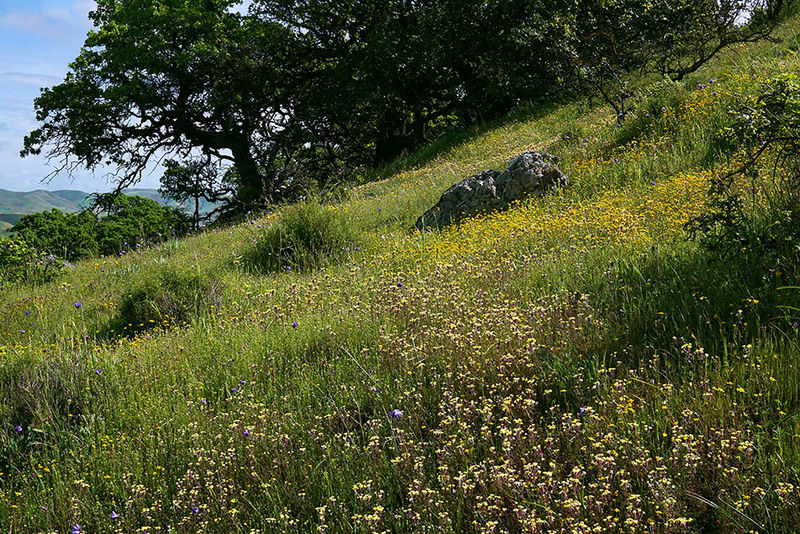 Blue oaks dominate the grasslands and there are also coast live oaks and buckeye. 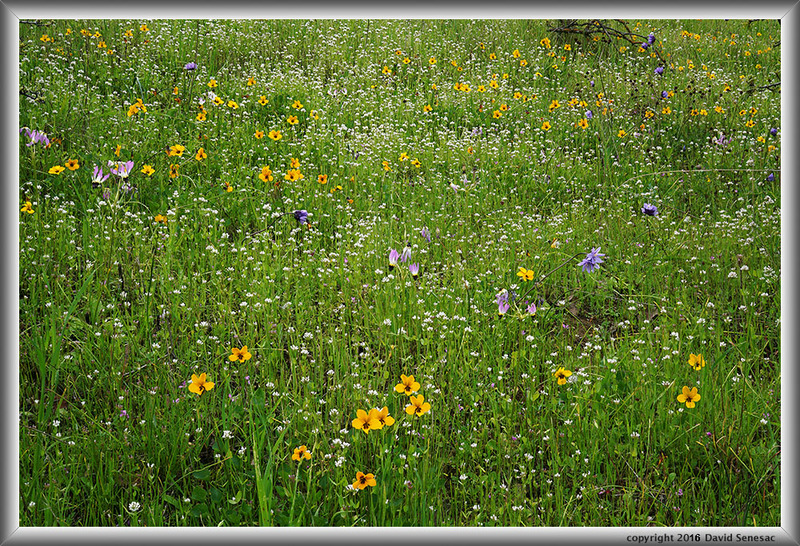 Most springs SLRWA and Pacheco Pass State Park have the best displays of wildflowers of any SF Bay Area parks though they tend to bloom earlier than parks to the north. However ironically it is the least visited of any of our local region state parks except by equestrians. The majority of Bay Area local park users have never been to the park because it is a longer drive at the southern end of the region and the state park is relatively new. Additionally the state park if only viewed from its main parking and picnic area is rather boring so visitors really do need to put their boots on and set out on its trails. The following image below shows a dense patch of butter-n-eggs, triphysaria eriantha, with goldfields and blue dicks. Ok a believer now? 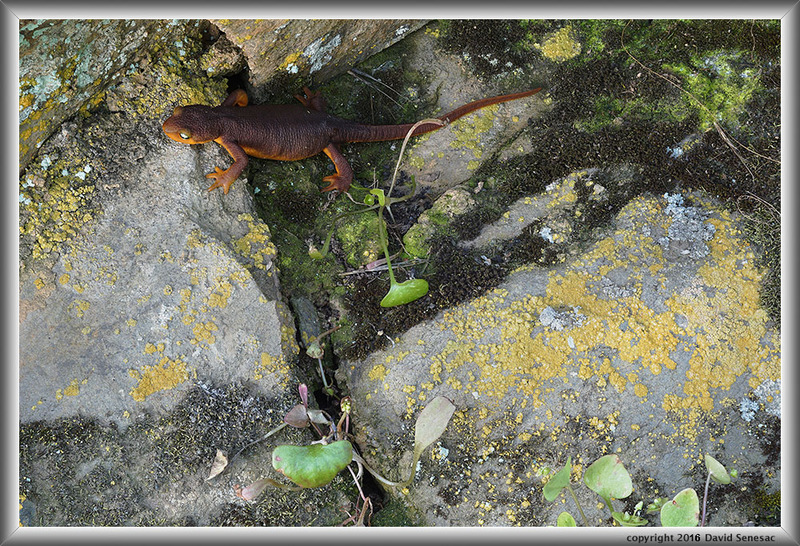 On the side of the ranch road I noticed a California newt, taricha torosa, in below image. These slowly moving orange brown hued amphibians are common in the area, a sign the region receives ample rains. I often see them along the seasonal stream beds or at the shady damp bases of coast live oak and buckeye trees where they likely spend hibernation periods. The small green plants are delicious miner's lettuce, claytonia perfoliata, that are abundant in the park, especially below tree canopies and northern exposures. Lichens and mosses cover the chalky Pliestocene Era marine sandstones of the area providing interesting colorful detail in close-ups. The enlarged vertical slice view shows the soft vulnerable creatures cartoon like head. 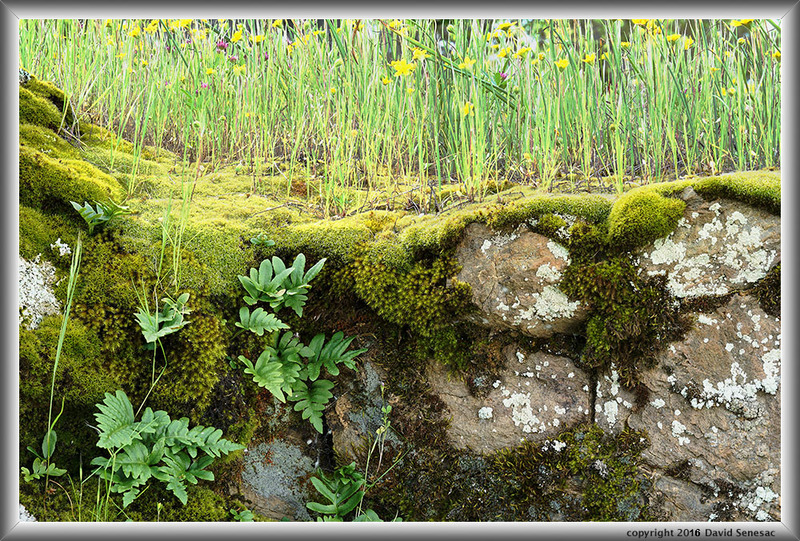 This next image below shows the side of a moss and lichen covered boulder with a fern and on top a jungle of goldfields, lasthenia californica, with a few purple hued tomcat clover, trifolium willdenovii. Goldfields have obviously just exploded, rising in the area as they are bright yellow and fragrant and with rains this week, more will continue to emerge within a few days. 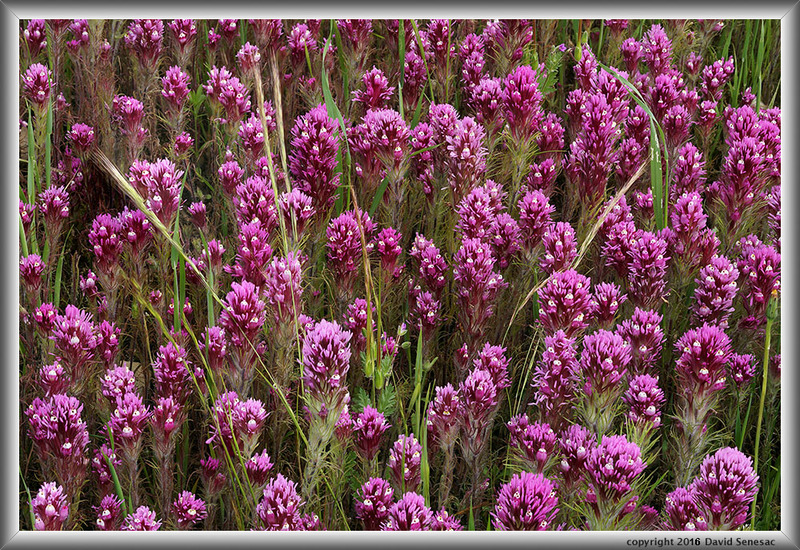 Frustrated by the wind I returned to my car, drove off then hiked out to a more obscure area that had large dense patches of purple owl's clover, castilleja exserta, a gaudy favorite of photographers. But don't expect many of these flowers in the park or WA as outside this one dense area, they are spotty. Despite the wind, I was patient enough to wait for enough of a lull that was long enough to fire off several focus stack shots quickly that required rapidly moving the focus point in the electronic viewfinder between each shot. The next image shows a group of large robust owl's clover with hill lotus, acmispon brachycarpus, that were common on the same slopes. 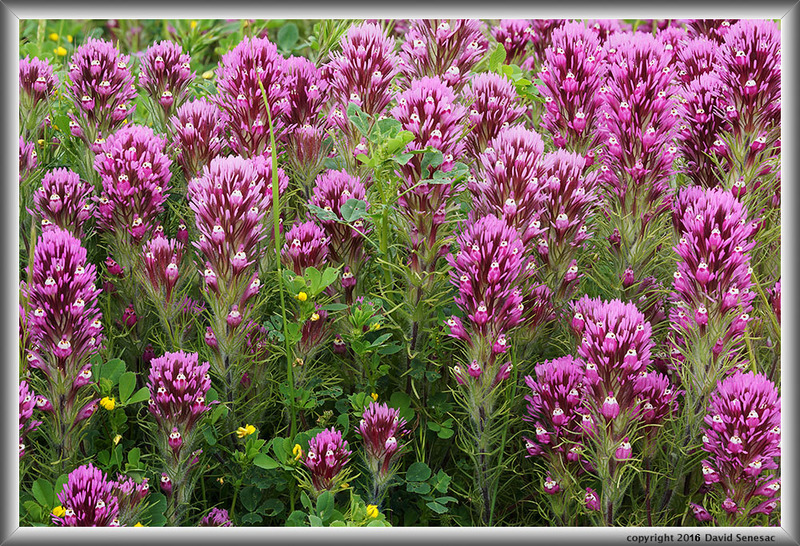 Additionally with the owl's clover were annual lupine and just emerging arroyo lupine. In the afternoon on some protected slopes, the wind under now totally dark cloudy skies had waned to a more manageable breeze. That allowed my capture of the intimate landscape at page top that shows what a wonderland these slopes look like now. The small white flower heads providing a distributed aesthetic background are white plectritis aka white seablush, plectritis macrocera, that supplied a delightful bright glow on many slopes. The yellow hued species is johnny-jump-up aka California violet, viola pedunculata, that were dense enough on some grassland slopes to be a prominent element of landscapes. Also Padre's shootingstar, dodecatheon clevelandii var. gracilis, that have the most abundant displays in the region at nearby Pacheco SP but peak early about mid February with most plants by this visit long gone to seed. Also blue hued blue dicks, dichelostemma capitatum, that are abundant in some areas and ubiquetous small pink hued filaree, erodium cicutarium. And at frame upper right are some dark round heads of purple sanicle, sanicula bipinnatifida. In the past, an even receding slope slope like this would be only fit for a large format view camera with tilt lens plain movements due to limited depth of field and diffraction. But in this era with digital camera focus stack blending, perfect focus is possible frame front to back. My final image of the day was the above intimate landscape of johnny-jump-up amid the grasses they seem to prefer to be residents within. For such a pessimistic day I had managed some nice images however there was so much the wind prevented my capturing that I began mulling how I might take a day off this coming midweek despite having to deal with preparation and logistics for a week long desert road trip by the weekend. 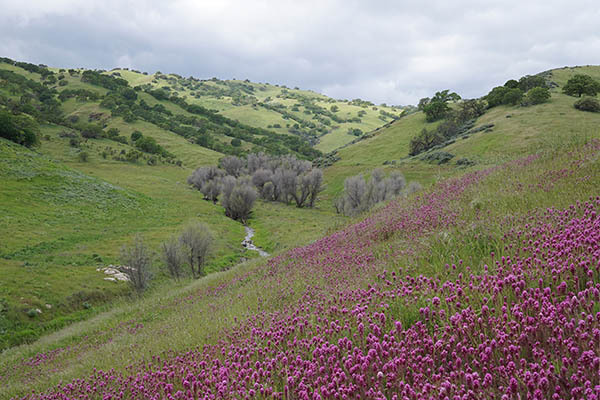 That is of course an issue with chasing spring wildflower landscapes during wet years in California. There are many places in the state where strong blooms occur at the same time and one can only be at one place at a time, so choices must be made. A strategy of spending a rushed single day at a list of places is not likely to be productive so the wiser plan in my experience is to just pick the most important destinations then allow enough time at each. In a week, the current week's rains ought to boost numbers of johnny-jump-ups and goldfields while providing extra growth for plants already in bloom. After visiting San Luis Reservoir Wildlife Area that I could see was peaking, I was intent on somehow visiting adjacent Pacheco Pass State Park before I went on a week long Death Valley road trip the following weekend. The only days in which winds would be reasonable were Friday through Saturday so added Friday making a 10-day period of PTO March 18 through March 28. I could also leave from my workplace early Thursday afternoon March 17 and thought that just might be enough to get in enough then hit the road to DV. If not I would stay overnight at the Oneil's Forebay campground and work Friday morning too before making the long drive to DV. Thursday was a nice sunny day and weather charts were showing breezes already slacking. Leaving my workplace at 1:30pm, I found traffic down US101 then east on SF152 at the limit so was at the park by 2:45pm. First I hiked down to the owls clover areas I worked the previous week above but did not see anything much better than I'd shot previously. Time not well spent. So quickly hiked back to the Forester and drove over to the nearby state park lot where at 4:30pm I popped a $9 senior rate into the fee can and was quickly off to a favorite zone less than a mile away. Conditions were even better than I expected but I could see the California poppies were already starting to close up so quickly went to work knocking of the image above at 4:45pm. There was a light breeze I had to wait for lulls before actuating my infrared shutter release. There were nice areas with johnn-jump-ups, goldfields, blue dicks, and holly-hocks about the northern and western exposures of a hill within a matrix of beautiful lush green grasses and herbs. I worked two other nice subjects before finding this next subject above that was the most lush. I worked two other nice subjects before finding this next subject above that was the most lush. Before packing up, I moved up the hill closer to the small live oak for a final shot below with a foreground of a few lichen covered sandstone rocks for this single frame 9 image focus stack blend above, sharp enough for a 16x24 inch print @250 ppi. And yes that is a jet contrail at frame upper left that per my natural non-manipulation style is left in though I'd prefer it not be there. Shows the modern era we humans now live in. It was 6:05pm or an hour from sunset. As I walked back the 15 minutes to the parking lot, my head was spinning with planning. Although there was much more I could work at Pacheco in the morning, as someone that has walked the park extensively, I'd probably found the best material and had enough images to be content with so would not need to stick around for Friday morning. So yes it was now on to Death Valley National Park. What a terrific start to this big trip. Within a half hour I'd hiked back to the parking lot, packed away gear, and had jumped into the heavy 70+ mph SR152 commute traffic screaming east down the 4-lane highway towards Los Banos.